1) Pschedule has a French localization but it is not included in ISO. but it is not in ISO. I grabbed it out of a debian package. 4) Why hasn't the screenshot program been localized? New kernel same of Wary-5.1.1-k2.6.32.28-small, without lang_pack. Download size 101MB. Wary-503q cannot show some UTF-8 characters on the menu. Get the jwm_font_repair.sh.gz from here and extract. thankX again for this 503q ! context: booting in pfix-ram from 503q-k.2.6.32.28-live-cd (md5sum OK) on the above-already-described-Fuji-Siemens PC - this usually runs with intel Xorg driver. 4) if now entering xwin, again get a black screen BUT! get the "woof-woof"'s 2barks.wav on the pc speaker. 5) if again doing ctrl-backspace ... then again get the command-line prompt ...choosing Xorg ... test...choice on 1024x768x16 (as usual on that PC) ... Xorg tells "OK for video, OK for card"...then black screen and again waiting...black screen forever...! 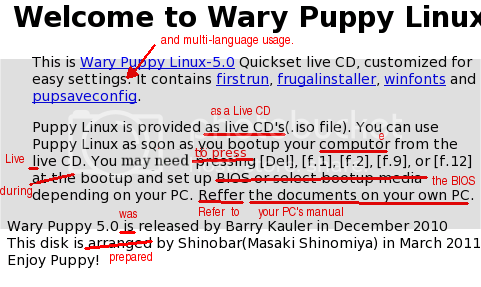 7) here doing ctrl-backspace ... then again get the command-line prompt, here doing xwin, again get a black screen and again get the "woof-woof"'s 2barks.wav on the pc speaker. Thus, all seems going as usual except that there is NOT ANY video ! On this PC+puppy the video is usually driven by the intel driver. ..have tested this on two identical Fuji pc's..! now something really crazy ! =-)) : this happened... just by accident...! 2) I ONLY selected the 3rd locale field (=keyboard locale) i.e. "be-latin1"; 1st field left unmodified. conclusion: So the locale setup works here if done in two steps; if 1st and 3rd locale-setup-fields are set in one step then I get a black screen...! Thanks anyway in advance for your time. Ooops ! was trivial question .... please disregard....deleted! Which devx.sfs should work with latest versions? It is needed for poedit. 503q is good, fast with ext4-savefile (it seems faster with ext4-savefile), but it's kernel 2.6.32.28 is not friendly with my PC (hangs up, same with Barry's Wary and Lupu) so I use it only to try. k2.6.31.14 is stable for me. You need not devx when you install the poedit-1.4.2-4.sfs by sfs_load. devx for 503q-k.2.6.32.28 is wary_devx_511.sfs. The devx files are not liseted both on bootmanager nor sfs_load. Right-click the SFS and select 'sfs_load'. Or, drag and drop the SFS on the left entry of the sfs_load main dialog. Will you try the i915.conf at /etc/modprobe.d? Extract the attached and place it at /etc/modprobe.d/i915.conf, and reboot PC. P.S. /usr/local/bin/jwm_font_repair.sh is missing in wary-50xq. But it need not for French(and most of European) characters, i guess. Now I could not reproduce the above «crazy» situation. 3) there doing Ctrl-backspace to retart Xorgwizard, there choice on Xorg, resolution 1024x768x16, test,...black screen again (but lets suppose everything is going on except video), doing Ctrl-backspace, doing 'xwin', black screen still again (but nevermind! ), Ctrl-backspace again, doing 'reboot', then accept SAVEFILE and fill in the personal save file name; doing reboot from live-cd choosing the first menu line and select the above save file, and then I get the video working; now the personal settings may be continued. So, it works if restart using a «without-visibility-on-black-screen-created» wary-503q-personal-savefile + current intel video driver. thanks ! I 'll give it a try. I must leave to work now! Have a nice ... hmmm! ...evening! 2) once Personalize Settings box is diplayed, do Ctrl-Alt-backspace to get the command line; left Personalize Settings unchanged. 9) now I get the wary5 screen displayed ! 10)Personalize Settings dialog box may now be set to locales etc...and pressing Ctrl-Alt-backspace keys returns to the command line. NB: this live-cd has been tested on 4 PC's; above procedure needed only on Fuji-Siemens with Video BoardName "82845G/GL[Brookdale-G]/GE Chipset Integrated Graphics Device"
How about choosing safe mode at the boot menu? I suggest a change of wording for your CD opening message. I discovered a bug in your installation of pschedule 1.0. Both pclock and pschedule work properly with the fix.